The proper term for this popular and active little bird is budgerigar. In some parts of the world, they are referred to as budgies. They are small birds with different color variations and two different sizes. There is the smaller standard budgerigar often called the Australian budgerigar or the American budgerigar and there is one a bit larger called the English Budgerigar. Both are quite popular in many countries, as they are one of the most commonly kept species of bird. Native to Australia, they are indeed a true parrot. In the wild, they inhabit the drier semi-arid inland areas of the continent as well as the grasslands of the Southeast. They feed on grasses, grains, insects and seeds. They were first bred for bird fanciers in the mid-1800’s and quickly became a very fashionable pet to have in the household. 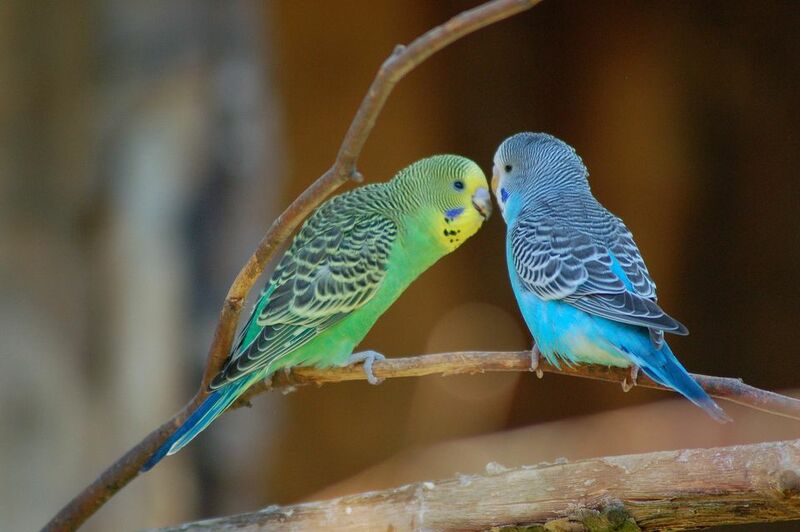 Budgies in the wild are primarily green but early on, breeders began to selectively breed them for different colors and they are now available for sale or adoption in many different colors. In captivity, many people think that they only require bird seed purchased at the pet store and nothing could be further from the truth. Offering fresh vegetables or chop and fresh fruit as well as a formulated pelleted diet will help keep your budgie healthy. Budgies are active birds and very playful. They enjoy roughhousing and if they are kept with another budgie they will often play together, rolling and tumbling about as well as sitting with each other taking turns preening each other. The average lifespan of these delightful little parrots is anywhere from six to eighteen years. A healthy diet will add more years to your budgies life so ensure you do research and learn how to provide a balanced diet. They enjoy playing with small toys as well as bells and other more delicate enrichment items. Remember, these are smart little birds and providing enrichment and foraging opportunities is important to their well being. In the wild, they live in holes in trees where they roost at night as well as using it as a nest hole to raise and protect their young. They tend to favor dead or decaying eucalyptus trees. When providing a living space for them in your home, the larger the enclosure, the better. With budgies, think width as opposed to height when shopping for a cage for them. These little guys are good flyers and the wider the cage is, the better. Since they originate from an arid part of Australia, they aren’t instinctively drawn to taking a bath or shower. You could offer them a small bowl of water to bathe in. In the wild, they seem to enjoy rolling around in wet grass or wet leaves after a rain to stay clean. So as an alternative, try offering wet lettuce leaves in a bowl or shallow pie pan and see if she will take you up on the offer by playing in the moist leaves. They are quite social birds and will indeed bond with humans. This might not be true if you have a pair as they might bond with their partner and you end up taking the back seat. But if you get two budgies and this happens, don’t be concerned. As long as they are happy, that is what matters. They are notoriously good talkers. But their voices are very soft and they tend to talk rapidly so you might not recognize the fact that your budgie does indeed have a wonderful vocabulary. Budgies are a captivating and fascinating species and they make wonderful companions. These should not be considered “starter birds.” Budgies should be recognized and respected for the species they are and for what they have to offer as a companion. Many people think that they will learn what they need to know about caring for a larger bird by caring for one of these wonderful little guys. This isn’t the case at all; these birds are not training wheels. If you want a fabulous little companion parrot that is active, playful and full of life and fun you might want to take a second look at a budgie. Most Parakeets make wonderful pets, are highly trainable, and many become excellent talkers! With all the different types of parakeets that are out there, it shouldn't be too hard to find one that is the right bird for you.